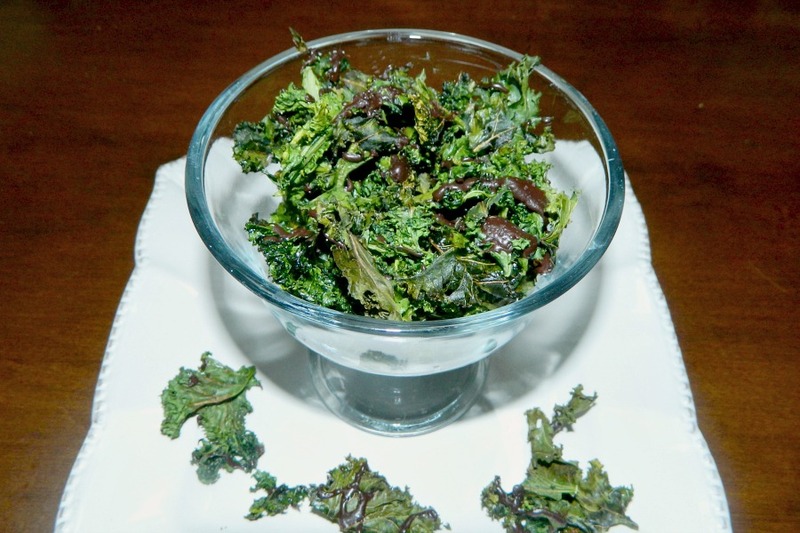 Dark Chocolate Drizzled Baked Kale Chips – This simple recipe has now become a favorite snack for my whole family. It’s got the sweet from the chocolate and just the right amount salty bite. Give this recipe a try and enjoy! With Kale becoming so popular in the last few years, it’s nice to have all different ways to enjoy this healthy, leafy green. We love kale in many savory dishes like this one… but, there’s another way to enjoy kale. Bake them on a sheet pan. They dry out to make a really crispy, crunchy chip. You can eat them just as or make them this way. Delicious, rich dark chocolate drizzled over the top. The perfect snack. Once you make them this way, I’m sure you will enjoy them like we do. Preheat oven to 325 degrees. Place non-stick aluminum foil, or regular foil on a cookie sheet and spray with coconut cooking spray. Set aside. After you wash and dry the kale, break up or cut up into bite size pieces. Drizzle oil over the kale and then sprinkle the salt. Bake for about 15 minutes and rotate the pan after about 10 minutes. Check to see if the kale is crispy after the cooking time. You may want to put back in the oven for 5 minutes more. Take out of the oven. Sprinkle 1/2 tsp of sugar over the kale and let cool. When the kale is almost cooled. Place the chips in the microwave for about 20 seconds. Take out and stir, place back in for about 10 seconds. Stir until nice and smooth and shiny. 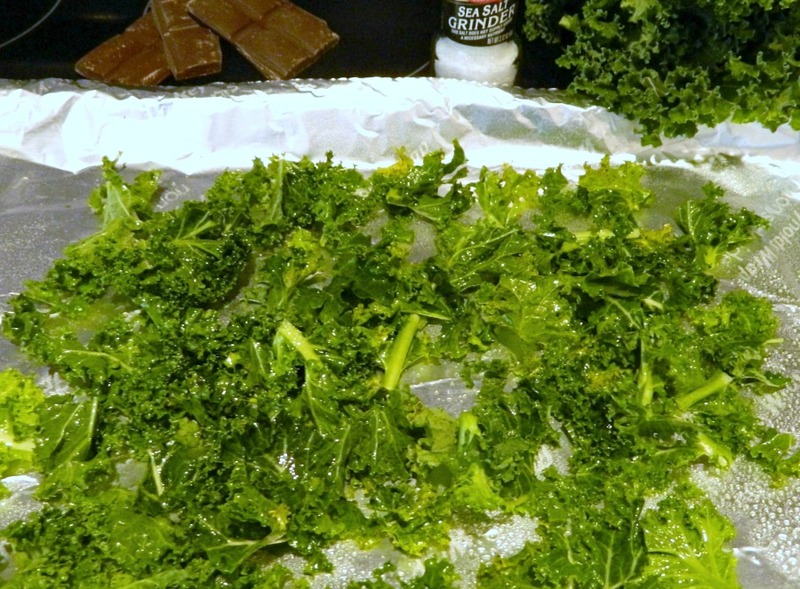 With the tip of a spoon, drizzle the chocolate over the kale. Use a rubber spatula to get all the chocolate. Now sprinkle the last 1/2 tsp of sugar over the whole batch of chocolate covered kale. Place in fridge for only 3 to 5 minutes. No longer. Take out and let sit on the counter for about 10 minutes and dig in! 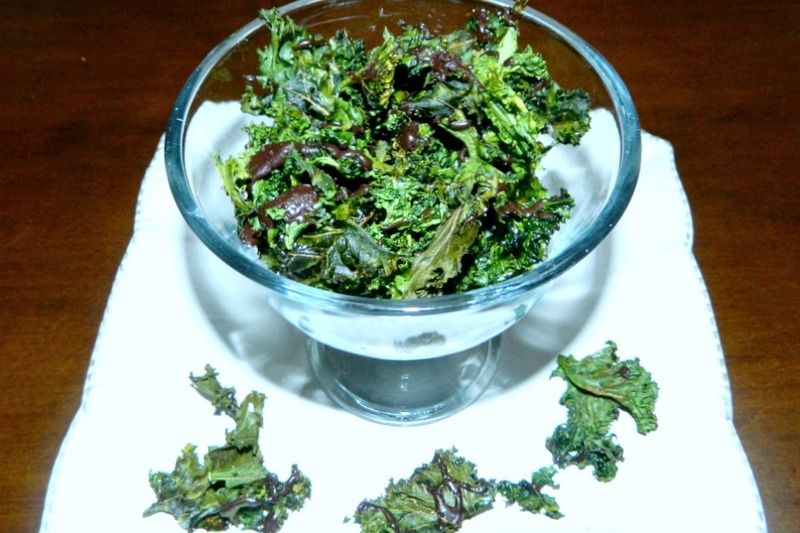 Dark Chocolate Drizzled Baked Kale Chips - This simple recipe has now become a favorite snack for my whole family. It's got the sweet from the chocolate and just the right amount salty bite. Give this recipe a try and enjoy! 1.Preheat oven to 325 degrees. Place non-stick aluminum foil, or regular foil on a cookie sheet and spray with coconut cooking spray. Set aside. 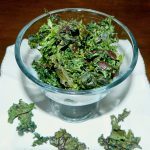 2.After you wash and dry the kale, break up or cut up into bite size pieces. 3.Drizzle oil over the kale and then sprinkle the salt. 4.Bake for about 15 minutes and rotate the pan after about 10 minutes. 5.Check to see if the kale is crispy after the cooking time. You may want to put back in the oven for 5 minutes more. 6.Take out of the oven. Sprinkle 1/2 tsp sugar over the kale and let cool. 7.When the kale is almost cooled. Place chocolate in microwave for about 20 seconds. Take out and stir, place back in for about 20 seconds. Do this until chocolate is almost melted. Stir until nice and smooth and shiny. 8.With the tip of a spoon, drizzle the chocolate over the kale. Use a rubber spatula to get all the chocolate. Now sprinkle the last 1/2 tsp of sugar over the whole batch of chocolate covered kale. 9.Place in fridge for only 3 to 5 minutes. No longer. Take out and let sit on the counter for about 10 minutes and dig in! Enjoy!